In a conversation where the topic is modern-day hypercars and supercars, the members of the most recent Holy Trinity will inevitably come up. I am, of course, referring to the McLaren P1, the Ferrari LaFerrari and the Porsche 918 Spyder. On top of the fact that these are epic, insanely fast, expensive and elite cars, they all share some form of electrification. You may or may not know this, but four years ago, when these cars were all the rage, there was another player and it only missed creating a super foursome because of its lowly output. 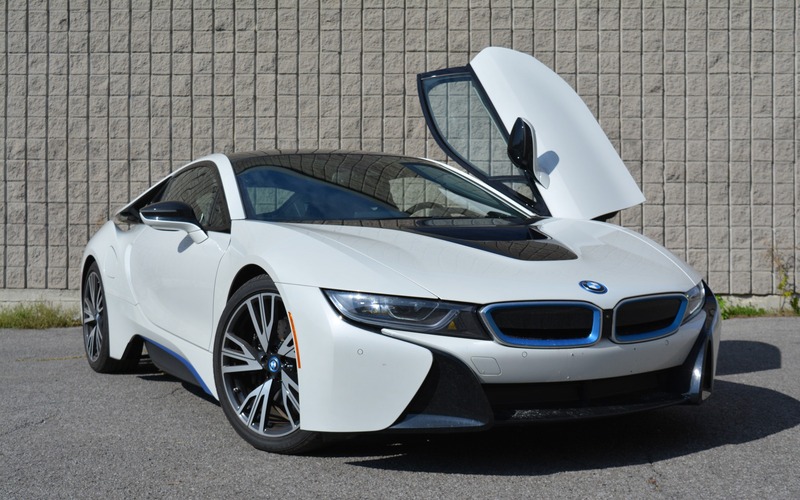 The BMW i8 does provide only 357 horsepower and 420 lb.-ft. of torque to its user, but from a styling standpoint, it matches or surpasses the others. If anything, it has outsold all of them combined (yes, they were all limited-run cars). Heck, we could throw in the new 2017 Acura NSX and BMW has still delivered more i8s altogether. The i8’s powertrain consists of a 7.1-kWh, high-voltage lithium-ion battery that feeds an eDrive electric motor up front, which develops 129 horsepower and 184 lb.-ft. of torque. When the car is running in full EV mode, it is being driven exclusively by the front wheels. It is possible to cover roughly 24 km on a full charge and reach speeds of up to 120 km/h without ever calling upon the petrol engine. The eDrive and Eco Pro drive modes limit the internal combustion engine’s interference, but never is the throttle pedal unpleasant or rubbery as it can be in other two-mode hybrid cars. Keeping the drive mode in the default Comfort setting narrows the operating gap for the engine, meaning it’ll step in quickly with an acute dab of throttle. When in EV mode, the i8 is no more threatening to drive than a Volkswagen e-Golf. Serenity and wellbeing surround and engulf the occupants—that is, until Sport mode is engaged. Be that as it may, this small bomb, with its 228 horsepower and 236 lb.-ft. of torque, quickly takes matters into its own hands. Mated to one of the sharpest, most responsive six-speed automatic (not a dual-clutch) transmissions, the i8 suddenly becomes capable of blasting off to 100 km/h in 4.4 seconds! From serenity to madness. Both ends of the car’s powertrain can work independently from one another and this is why I was able to average only 5.5 litres of fuel per 100 km. But this is not the best part. The 2017 BMW i8’s carbon fibre tub is obviously lightweight and rigid. Such a platform is a blessing for suspension and steering tuning. The dynamic dampers are tuned not to be overly firm, but in such a way as to maintain a decent level of comfort. By permitting some wheel travel, BMW has managed to create a car that is sharp and alert, but never harsh. 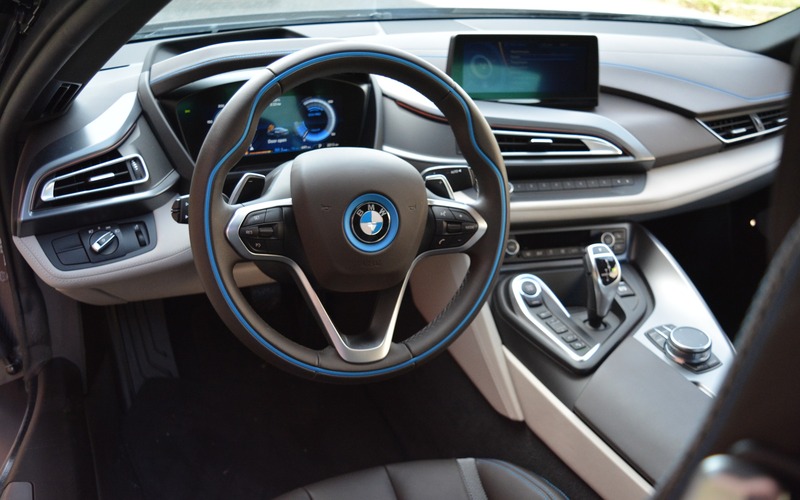 In turn, the steering’s ability to extract maximum feedback from the tires instills a high level of confidence in the i8’ deep well of available grip. 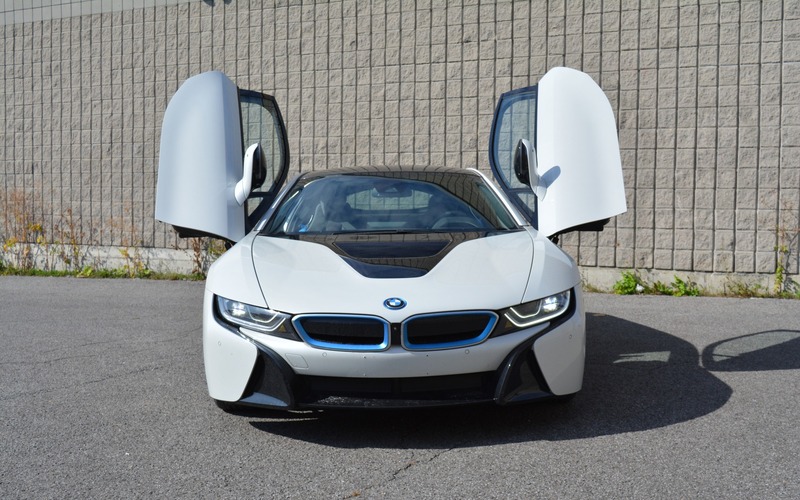 Ultimately, the i8 is about attracting attention to either the brand or the owner, or both. Despite the fact that the car is nearly four years old, there are precious few on the road, so exclusivity is ensured. If seeing one drive by is not enough of a show, then spotting one pull up and open its butterfly doors will certainly catch everyone’s attention. It is challenging to get in and out of the i8, but thankfully, I’m still a young-ish buck flexible enough to lean back as I step in, without whacking my head on the door, severely scuffing the dash with my shoe or throwing out my back. This is not an elegant exercise but then, nor is the i8’s styling exercise. The BMW i8 looks like the proverbial spaceship and the more time you take to soak in all the crazy aero and bodywork, the more insane the car’s styling becomes. My favourite point of view is the front. It reminds me of the most handsome BMW ever, the E24 M6 and there’s a dash of M1 in there too. Unlike the exterior, the cabin is somewhat more sedate, but still quite original. There are many layers of materials stacked together, covered in various materials. The switchgear is familiar BMW stock so there’s no adaptation period. The front seats are excellent; however, the rear pockets that double as seats are for kids under five feet in height. There are few spots to empty your pockets into and forget about door bins—imagine what would happen when you open the doors. And then there’s a trunk barely capable of holding a small piece of luggage. Clearly, the i8 is about driving around, without exactly going somewhere or bringing much with you. I asked myself the same question when I reviewed the NSX: who is this car for? Undoubtedly, it is for those that have the money, but if you were one of these well-heeled people, would you not prefer a Porsche 911, an Audi R8, a McLaren 540C or even a tricked-out BMW M6? Don’t get me wrong, I really enjoyed my time with the i8. Even so, unless I had more millions of dollars than brains, I don’t see myself ever purchasing one. 10/10	I averaged an incredible 5.5 L/100 km!! 8/10	Good ride quality, quiet enough, great seats, but short on headroom. 9/10	Very fast, and loud, or smooth and quiet. 8/10	Well-appointed and familiar, although some menus take a while to scroll through. 8/10	A paradox of civility and rage. Incredible handling. 8/10	The i8 is a staggering car, but in the end, it’s nothing more than a showpiece. Los Angeles 2019 BMW i8 Roadster: It’s Here and It’s Beautiful!